Michael Brindisi could make melodic lemonade out of any old song-and-dance lemon if you give him half a chance. The man loooooves musicals, that’s all there’s to it. So when he declares, “This is my all-time favorite!” you know it’s among the best of the best. And it is. It’s Fiddler on the Roof. Oddly, “Tradition!” has not exactly been a tradition on the stage of Chanhassen Dinner Theatre, where he serves as president and artistic director. It’s been performed only four times in the dinner theatre’s 45-year history, and not for 20 years at that. Plus, it’s the 50th anniversary of the beloved show’s debut on Broadway, choreographed by Jerome Robbins in 1964. Brindisi himself has performed in it three times (twice at Chan, in 1978 and 1987) and directed it twice. But, even if you can remember that far back, don’t expect the same-old, same-old. “A really new, exciting concept,” he promises—“different scenically from what people expect: more organic and realistic. It’ll be set in a Russian pine forest—fairly minimal—which will really focus the story. The orchestra will be integrated into the forest, augmented by actors as strolling musicians. And Music Director Andrew Cooke has orchestrated a klezmer band feeling, too,” he adds. Fiddler’s cast includes plenty of Chan “warhorses,” too: the familiar faces and voices of Kent Rice as Tevye, Michelle Barber as Golde, along with David Anthony Brinkley, Jared Oxborough, and Molly Sue McDonald as the fiddler. In 1978 Brindisi played the tailor. Later, while auditioning for then-director Gary Gisselman in 1987, Brindisi acknowledged, “I suppose I’m too old for the tailor again? How about the beggar, the bookseller, the innkeeper…anything?” Gisselman wisely cast him as the tailor. 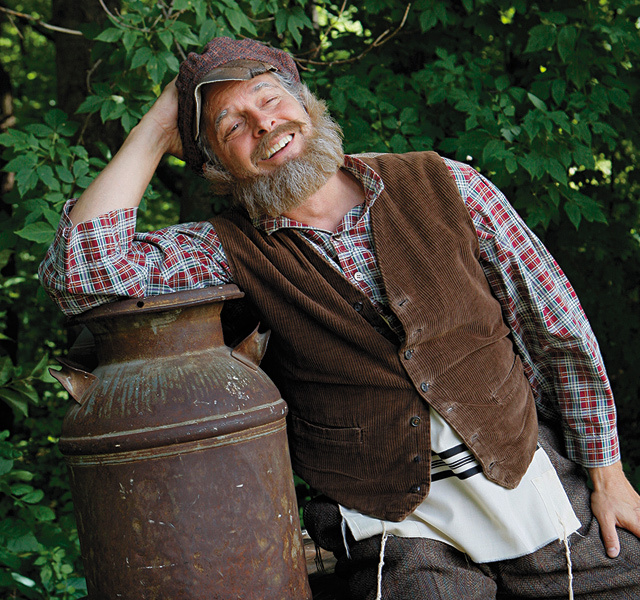 This time, he’ll stick to the director’s chair— unless Tevye gets sick. As his understudy, Michael is growing a beard. Just in case. And, just maybe, fingers crossed: “If I were in purgatory and had to do one show for the rest of eternity, it’d be Fiddler,” he declares. The production runs from September 27 through January 25—a great Christmas season show, too. For information: 952-934-1525 or www.chanhassendt.com.